Music has always played an important role in all our lives, especially Reggae, the music genre first developed in Jamaica, strongly influenced by traditional African, American jazz and old-time rhythm and blues. Reggae owes its direct origins to the progressive development of Ska and Rocksteady in 1960s Jamaica. Each month, THE MUSICAL COA-COA BASKET will salute the legendary artists and recording studios from out of Jamaica that have placed reggae on the musical global map. The legendary recording producer Joe Gibbs passed away on 21 February 2008 at Kingston’s University Hospital of the West Indies from a heart attack. Aged 65, Gibbs left behind an impressive back catalogue of music, the bulk of its contents given classic status by Jamaican music enthusiasts. However, these songs have also had a truly global impact, inspiring and influencing everything from punk to the very latest British urban music. Born in Montego Bay in 1942, Gibbs left Jamaica to train as an engineer in the United States. He returned to the island in the mid-1960s to set up a TV repair shop, before he made his first venture into the music industry when he diversified into record retail from the same store front, stacking boxes of 45s alongside the broken-down electrical equipment. In 1967, shortly after this sideline proved a runaway success, he took the natural step of setting up a DIY recording studio in the office at the rear of the building. Despite falling into the business more or less by accident, Gibbs had a hand in some of the biggest hits of the rocksteady era, his Amalgamated imprint almost singlehandeldy establishing the genre with Roy Shirley’s Hold Them. Gibbs was also clever in his collaborations, first enlisting the studio talents of a young Lee Perry and subsequently, Winston Holness aka Niney The Observer. Both alliances paid off, and throughout this period his operation churned out a flood of popular music by artists including Errol Dunkley, Sir Lord Comic and The Pioneers. 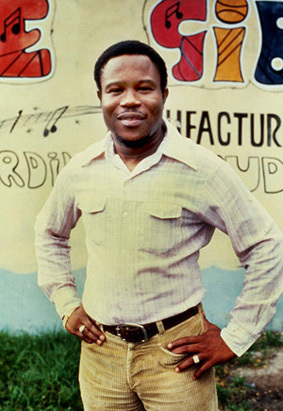 However, it was the later reggae sound that brought Gibbs his first international success, scoring a UK top 10 entry in 1970 with Nicky Thomas’s Love of The Common People (later covered by Paul Young) and starting a more hands-on working relationship with Errol Thompson and house band the Professionals, an outfit that included among its members bassist Robbie Shakespeare and drummer Sly Dunbar. 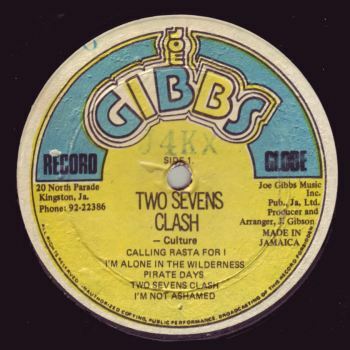 Thanks to an unstoppable run of hits, numbering among them more than 100 Jamaican No 1s, Gibbs and Thompson would soon become known as “The Mighty Two”. Through out the mid-1970s, they continued to produce the biggest artists in Jamaica, The Mighty Diamonds, Beres Hammond, Dennis Brown and Gregory Isaacs to name but a few, releasing songs across a bewildering and continually changing array of labels. However, the end of the decade would bring about their most famous work, from Althea & Donna’s 1977 pop crossover anthem Uptown Top Ranking to Culture’s Two Sevens Clash – an album that would come to be a key reference for bands including the Clash and the Slits, and JC Lodge’s 1980 smash Someone Loves You Honey. Gibbs never enjoyed quite the same level of success later in his life, but by thispoint he could afford to slow down, having already established himself as one of reggae’s most important figures. Accordingly, he continued to enjoy the respect of both his peers and generations of younger performers. This can be seen on veteran producers Steely & Clevie’s 2002 album Old to the New: A Steely & Clevie Tribute to Joe Gibbs Classics, yielding Sean Paul and Sasha’s hit single I’m So in Love With You. This project marked four decades in the international charts for Gibbs. With that in mind, it’s no stretch to say that he will be remembered as a man responsible for some of the most important music to ever have emerged from Jamaica’s fertile cultural turf. So kick back, click on the tracks below and listen to some of the classics Joe Gibbs produced. People Grudgeful – Sir Gibbs; Pan-Ya-Macete – Sir Gibbs (Pioneers); Kingstoians Reggae – Joe Gibbs All Stars; Cool Out Son – Junior Murvin; Babylon Too Rough – Gregory Isaacs; Two Timer – Cornell Campbell; Three Piece Suit – Trinity; How Can I Leave – Dennis Brown; If This World Were Mine – Dennis Brown; I’m Still in Love With You Boy – Marcia Aitkin; Boxing Around – Cornel Campbell; Chapter Three – Joe Gibbs; Loving Pauper/Judgement time – Ruddy Thoms & Trinity; Concrete Castle King – Dennis Brown; Deliverance Will Come – Dennis Brown; Milk & Honey – Dennis Brown; Officially – Lloyd Parks; Just Like A River – Mighty Diamonds & Ranking Joe; Two Seven Clash – Culture. This entry was posted on July 31, 2011 at 2:01 pm and is filed under Articles, Black History, News, Newsletter, Writing with tags Articles, Black History, News, Newsletter, Writing. You can follow any responses to this entry through the RSS 2.0 feed. You can leave a response, or trackback from your own site. GREAT REVIEW! – Fantastic article! Thank you, this info is very valuable in regards to the history of reggae music. Keep them coming and keep up the good work! You’ve got one more reader of your web blog 🙂 – Peace and blessings – Isabella S.